Orlando Cepeda, one of a trio of Hall of Fame sluggers for the San Francisco Giants in the 1960s, was also a groundbreaking star who became the first Puerto Rican player to reach many MLB milestones. Some of the best Orlando Cepeda baseball card appearances are detailed below, including his valuable rookie card and several combination cards he shares with other legends. 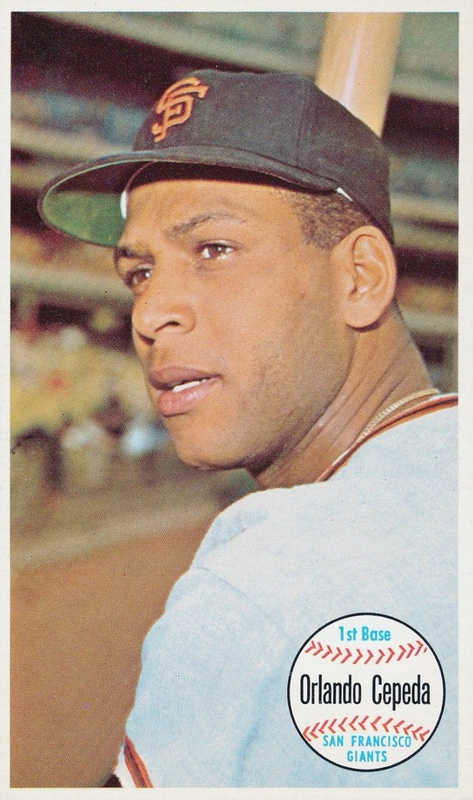 Cepeda made the leap to the majors in 1958 as a first baseman, quickly establishing himself as a player to be reckoned with as he became the second player to ever be selected unanimously as Rookie of the Year. Along with teammates Willie Mays and Willie McCovey, Cepeda dominated National League pitching for nearly a decade. His best statistical season was in 1961 when he hit 46 home runs, 142 RBI, and finished second in the Most Valuable Player voting (NL). Cepeda later captured an MVP Award and a World Series crown in 1967 after being traded to the St. Louis Cardinals. Shop for Professionally Graded Orlando Cepeda cards on eBay. 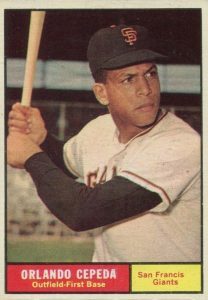 While all of the cards on this list show Cepeda in a Giants uniform, he also played for several other teams during his career. His 1967 Topps card features him in a Cardinals uniform following his trade to the team in 1966. Atlanta Braves fans can find Cepeda in 1969 Topps when he was briefly Hank Aaron's teammate. Coming later, 1973 Topps offers Cepeda's only Topps card with the Oakland A's and 1974 Topps includes his sole appearance with the Boston Red Sox. The '74 set was also his final Topps card as an active player. 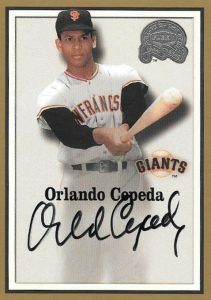 On the premium side, Orlando Cepeda continues to be a frequent autograph signer for both Topps and Panini. Modern signature seekers can find Cepeda autographs in 2016 Topps Tier One, 2016 Topps The Mint Baseball, and 2015 Panini Prizm. Another notable Cepeda autograph can be found in 2005 Upper Deck Ultimate Collection as a dual signature with his Cardinals 1967 World Series-winning teammate Stan Musial. 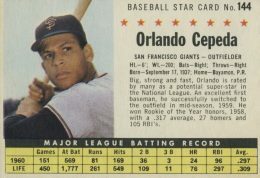 Although his statistical numbers suffered because of several knee injuries, Cepeda's career was remarkable as the first great Puerto Rican player in the major leagues. When considering each card's placement on the list, a key factor is the card's value, as well as the overall set importance and individual card design. 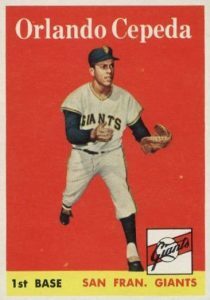 My personal favorite of all of Topps' oversized card sets, 1964 Topps Giants was the company's first postcard-size offering ever. With 60 cards included, the checklist is a who's who of stars in the league at the time, increasing the set's popularity years later. The backside of the card features a news headline format and Cepeda's card highlights his Rookie of the Year season. A handful of cards in the set also appear to have been short-printed, including teammate Willie Mays' card. Orlando's 1961 Topps card offers collectors who are on a budget a great starting spot to begin their Cepeda collection. The card design accommodates a huge player photo which helps the current interest. Later in his career, Cepeda would become the first player to sign a designated hitter contract while with the Boston Red Sox. He would have success at the position, setting another record as the first player to notch 20 or more home runs in a season with four different teams. Fans looking for 1961 Post cards may be surprised to find that they seem to have perforated edges instead of the straight edges you typically expect from cards that were cut from a cereal box. Those perforated edged cards came from what has been called "company sheets," which were the ten-player team sets that came printed together but could be separated by the perforated borders. The sets were available through a mail-in offer from Post and came with a slightly thinner cardboard compared to cereal boxes. For collectors who love simplistically beautiful baseball cards, the 1960 Leaf set more than fits the bill. The black-and-white set keeps it simple by only featuring portrait photos, many of which have the famous halo around their head. While Topps had its packs full of chewing gum, these cards were packaged with a marble, believe it or not. 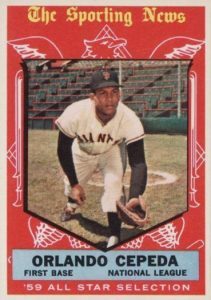 The 144-card set was sold in two series and Cepeda's card gets a value boost as those second series cards are much more difficult to find today. Of all the combination cards that feature multiple Hall of Fame members together, this one may be the all-time champion. This card from 1963 Topps features the best NL sluggers from the prior year, including Cepeda. 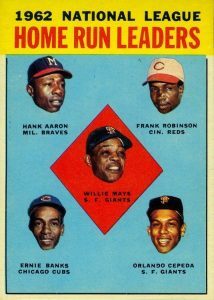 The loaded lineup also adds Hank Aaron, Ernie Banks, Frank Robinson and Willie Mays, who led the league with 49 homers. In total, these five remarkable players accumulated 2,892 home runs over their careers. 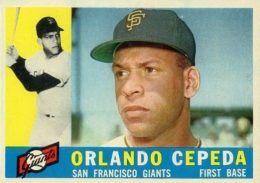 Topps returned to a horizontal design with the 1960 set and Cepeda gives a very stern image on his card. The reverse side highlights Cepeda's origins in Puerto Rico, one of the United States' territories. Cepeda came from a family with a rich baseball history. His father, Pedro Cepeda, was one of the best players of his generation but never got a chance in the majors due to the segregation rules in place at the time. Orlando would become the first Puerto Rican All-Star as well as the first to win a home run title. While Roger Maris and Mickey Mantle were having a home run battle for the ages during the 1961 season, Cepeda quietly owned National League pitching and led the league with 46 home runs. 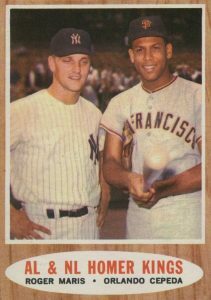 Topps included a 1962 card honoring the two league leaders and Cepeda aims his bat towards the camera as Maris gives a big smile. The card's value gets a bump above and beyond typical Cepeda cards as anything featuring Maris as a New York Yankee attracts a lot of fans (and their wallets). The 2000 Fleer Greats of the Game set features a lovely Cepeda autograph along with a San Francisco Giants-era photograph. Orlando's autograph has many distinctive features such as several missing letters from the spelling of his first name. The penmanship on "Cepeda" is often much more clear with the final letter "a" frequently replaced by a dash down rather than the letter itself. As Cepeda has grown older, some of his autograph examples are not as clear, but collectors do have many options to choose from over many years and sets. Fans have two options for Cepeda cards in 1959 Topps between his standard base card and bright-red, The Sporting News All-Star card pictured below. Topps introduced the All-Star subset into their product the year before and the 1959 All-Stars were again located in the high-numbered, short-printed series. This made the hard-to-find cards of the best players in the game some of the most valuable in the set. 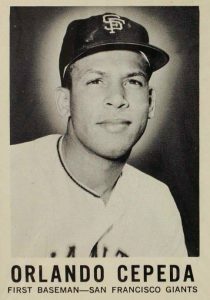 Cepeda played in 11 All-Star games over his 17 seasons, including two a season during the late 1950s and early 1960s when the Midsummer Classic was actually played twice each year. Cepeda's 1958 Topps card has the distinction of being the only Hall of Fame rookie card in the set, giving it a value boost for collectors only interested in the Cooperstown residents. Cepeda's rookie season was impressive as he hit .312 with 25 home runs, 96 RBI, and led the NL in doubles. He was also the unanimous Rookie of the Year, becoming the second player to have that honor after Frank Robinson. In a set that is very rare to find in gem-mint condition, graded near-mint/mint copies of Orlando's rookie can top $500 at auction. Orlando Cepeda Original Rookie Card Priced To Sell! Very Nice Card! 2004 Finest Moments Orlando Cepeda Auto Issue #FMADC - PSA 8! Giants! 2004 Finest Moments Orlando Cepeda Auto Issue #FMADC - PSA 9! Giants!